Flexible hinge swings for safety and returns to neutral position. This feature is optimal for retail store aisles with high traffic to ensure the sign stays in place. Comes in two Grip-Tite™ sizes with capacity of up to .100" and from .100" to .250"
If looking for a different style of wall mount sign holder, we carry many others that may fit a different need, if we don't, give us call, we may be able to make it for you. For finding other sign holders, go to our main section and navigate from there. 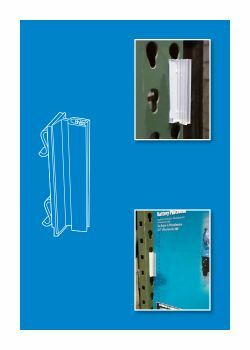 Minimum quantity for "Warehouse Upright / Gondola Upright Grip-Tite™ Flexible Sign Holder, WUGT-01" is 25. Minimum quantity for "Warehouse Upright / Gondola Upright Grip-Tite™ Flexible Sign Holder, WUGT-02" is 25. 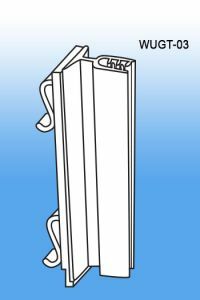 Minimum quantity for "Warehouse Upright / Gondola Upright Grip-Tite™ Sign Holder, WUGT-03" is 25. Minimum quantity for "Warehouse Upright / Gondola Upright Grip-Tite™ Sign Holder, WUGT-04" is 25.